Transparency Market Research (TMR) has published a new report titled, “Pediatric Healthcare Products and Services Market - Global Industry Analysis, Size, Share, Growth, Trends, and Forecast, 2018–2026”. According to the report, the global pediatric health care products and services market was valued at US$ 88,000 Mn and US$ 520,000 Mn, respectively, in 2017 and is projected to expand at a CAGR of 4.5% and 5.5% from 2018 to 2026. Rise in disorders and diseases among children is expected to drive demand for drugs used in the treatment of these conditions from 2018 to 2026. Increase in funding for research on pediatric disorders, especially in countries such as the U.S., the U.K., and Germany, is expected to result in new treatment options for the management of various ailments in children. Rise in number of children with disorders and diseases such as allergies, asthma and other respiratory disorders, high blood pressure, obesity, mental disorders, and infectious diseases drives the global market. Moreover, increasing awareness levels about pediatric health, rise in the number of programs targeted towards safeguarding the interests and rights of the children along with promoting comprehensive development in them are expected to help in improving the overall well-being of children and boost the growth of the market during the forecast period. Countries across the globe are partnering with the industry in order to develop novel drugs for addressing concerns arising due to resistance developed by microorganisms toward antibiotic drugs. These initiatives are anticipated to channelize more investments for developing new and improved medicines to be used for combating antibiotic-resistant bacteria. 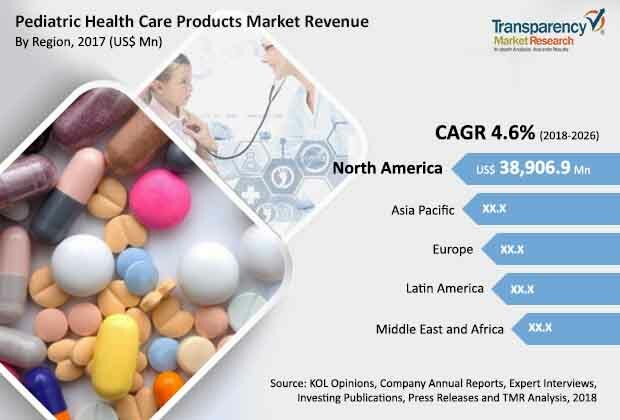 Major pharmaceutical companies are focusing on new product launches along with expanding the indications of existing drugs for pediatric patients in order to tap into the large unmet needs and also subsequently boost their market share. These factors are likely to accelerate the growth of the market during the forecast period. However, stringent regulatory requirements are likely to restrain the market. The report offers detailed segmentation of the global pediatric health care products and services market based on drug class, diseases/disorders, and services type. In terms of drug class, the antibiotics segment is projected to capture major share of the market from 2018 to 2026. Significant market share of the segment is attributed to high prescription rates for antibiotics among children and inclination toward self-medication particularly in low income countries. The antidepressants segment is likely to account for 4.0% market share by 2026 due to rise in the number of children and adolescents affected with depression and anxiety across the world. The allergy and respiratory segment is likely to account for the major share of the market by 2026. The segment is expected to expand at a high growth rate during the forecast period. Growth of the segment is attributed to rise in demand for pediatric health care products for allergy and respiratory disorders. The hormonal imbalance segment held 4.0% market share in 2017. The other pediatric health care services segment is anticipated to capture for dominant share of the global pediatric health care products and services market during the forecast period owing to rise in burden of diseases and disorders such as infectious diseases, allergies, asthma, and other respiratory conditions among children. Moreover, increase in emphasis on newborn screening programs focused on detecting various health conditions in infants is expected to boost the growth of the segment from 2018 to 2026. North America accounted for the leading share of the global pediatric health care products and services market in 2017. Substantial market share of the region is due to launch of new drugs by pharmaceutical companies targeted at pediatric patients. The market in Asia Pacific is projected to expand at a significant CAGR during the forecast period, driven by increase in number of children with diseases and disorders and improvement in health care infrastructure in countries such as China, India, and Indonesia.